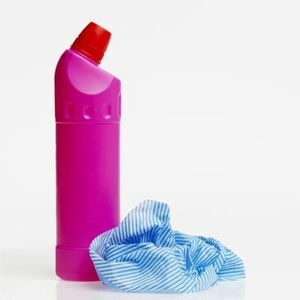 Bleach is basically a household cleaning agent that can be put into a variety of uses. It is very important to have it around especially if you have kids. It is used to disinfect floors and surfaces and reduce contact with germs. However, it is also very important to note that bleach could be harmful and should therefore be kept out of the reach of children. Bleach it is used for washing toilets and toiletries and also for Laundry. Bleach is used in Laboratories for washing petri-dishes, test tubes and other glass wares. It is also used in the fashion industry for fading fabrics and creating patterns on finished clothing. Let me show you how to make your own bleach in few easy steps. Note: It is the same method used in the production of commercial bleach so you might as well consider starting commercial production and make some money for yourself. Containers and packaging materials for commercial production. To 5Ltrs of water in a container, add a quarter of 1Kg of Chlorine and a quarter of 1Kg of foaming agent. Also add half kilogram of Caustic Soda crystals and a Kilogram of Soda Ash to the solution. Allow the mixture to react for 2 to 3 hours, then filter it properly and add perfume. You can then package in containers. WARNING!! The whole production process must be carried out with strict observance of all safety precautionary measures. NOTE: The average shelf life of liquid bleach stored between 50 and 70 degrees Fahrenheit is around 6 months after which it will lose 20% of its strength so you might consider making bleach only when you need it. I tried your recipe but after 3 hours it is still cloudy and not in yellow color nor it's smell like bleach as commercial bleach is available in market. Can you please let me know in detail how can I make commercial bleach using your recipe. what about using 1kg of Chlorine, 1kg of Soda ash and half Kg of caustic soda, then add ur foaming agent and perfumes..
Do u have any idea of glass Cleaner? Ummm, Chlorine is a yellow GAS. Obviously this is not what you are using? When you say Chlorine, what exactly do you mean?